I remembered how I wrote about how I called GoGoFive as a product of Fiveman and Winspector. Now one can always argue that Timeranger is the end of the 20th century Heisei era Super Sentai yet GoGoFive is the end of the 90s. We can consider how it seems the 90s got planned accordingly by Toei huh? GoGoFive can be considered as a pretty innovative series yet I can't deny that I do have my shifting opinions towards it. So what's with the 90s? So I guess the same Power Rangers snobs from last decade (or earlier) who made up the lies that Mighty Morphin' was more popular than Zyuranger in Japan or that Lost Galaxy is more popular than Gingaman in Japan (though no offense to Lost Galaxy fans who like said show over its source). 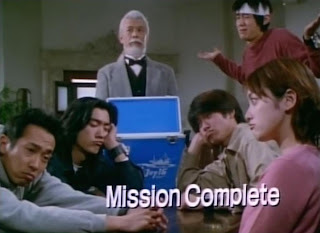 So I may no longer like Shinkenger that much like I used to (though it's still in my list of favorites) because I think Yasuko Kobayashi's best work is Timeranger, I don't like the idea of fans giving it too much praise but to call it the "benchmark of last decade's quality" is just funny. I even want to say I wonder if such people ever saw other Super Sentai before and after it -- I even think Gekiranger was the best Super Sentai series during the 2000s! Bonjour my readers! Well it looks like le days that I'm pretending to be French are over but you guess I wasn't French huh? It's almost for le final episode. This is going to be that intriguing turn of events when both sides will have to join forces to defeat le Gangler. 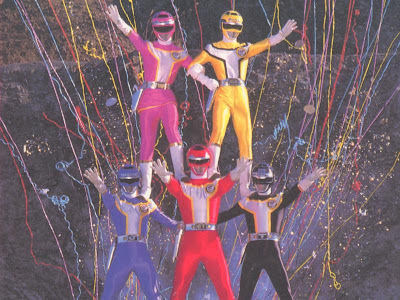 Last week's episode features le Lupinrangers finally unmasking themselves to save a friend. Le Global Police now investigate le restaurant Bistror Jurer for clues but they don't find any. 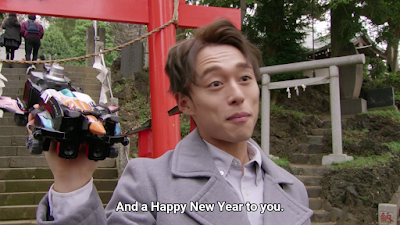 This scene has Keiichiro expressing his rather human side -- beneath his tough guy jerkass behavior is still a heart of gold that's hidden under it! Keiichiro still wants to cool off one way or another after what just happened. 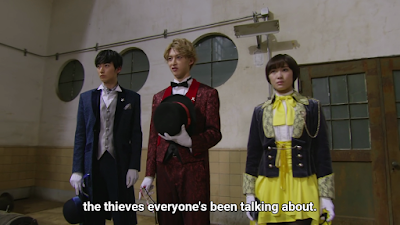 Meanwhile, le Lupinrangers move to what could be le Lupin Estate. So did Noel inherit said estate and it looks like he's been that young master after all! They are now le headlines after they voluntarily unmasked themselves to save Noel. I keep hearing of how great the super-rushed Power Rangers RPM is. I can't really compare RPM to the rather goofy happy-go-lucky Engine Sentai Go-Onger. 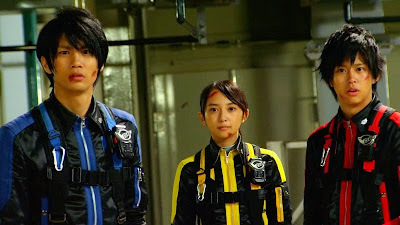 Instead, I think I can compare it to a series that came a few years later namely Tokumei Sentai Go-Busters. The references from Power Rangers can be seen such as every robot is called a Megazord (though Timeranger had an enemy mecha called G-Zord), the phrase "It's Morphin' Time" and a sentient computer virus for an enemy. 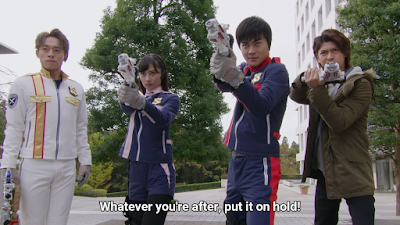 I may not consider Go-Busters to be a perfect series but so far -- I think it's my favorite post-Gokaiger Super Sentai. I do like Kyuranger but I think Go-Busters still gets better -- maybe because cause it's Yasuko Kobayashi? Maybe, maybe not. I heard of a rumor that Power Rangers SPD was supposedly more popular than Japan. Huh? Really? It was like the rumor that Lost Galaxy was supposedly more popular than Gingaman in Japan which was long proven false by Sentai Bandicoot aka Fantasy Leader. So I thought about the whole rumor and why it's just blatantly false. 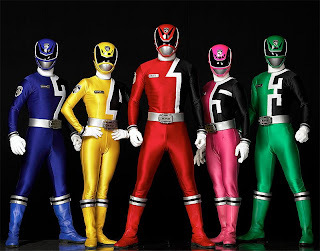 While I do admit that the Dekaranger main cast voiced their SPD counterparts, I do admit Power Rangers gets dubbed into Japanese in Japan but is it really all that popular? I think Power Rangers only gets dubbed in Japan for cultural exchange reasons (and I don't buy the story that the franchise is supposedly an act of "cultural erasure" either) but lying that SPD is supposedly more popular than Dekaranger in Japan is uncalled for. Was it from the same people who spread the rumor that Lost Galaxy (which was popular in the U.S.) was more popular than Gingaman (which was popular in Japan)? I can't be certain but seems like it. Bonjour my readers! Well it's time for le final arc as it develops. This time, le Phantom Thieves are now unmasked before the audience. 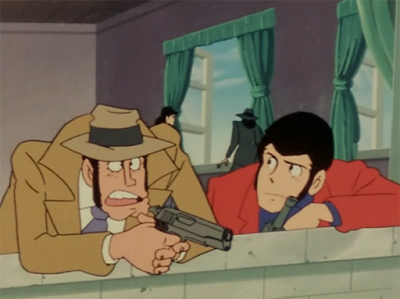 So let's get started shall we with this weekly review as Lupin vs. Pat is about to reach its conclusion! We start where last week left off with le capture of Noel. Noel is about to become a human dissection and it's broadcast live. I find le whole idea to be quite frightening even if it hasn't happened. Fortunatetly, Super Sentai right now must follow whatever guidelines Japanese censorship has in regards to le amount of violence. This is pretty much a dilemma on le side of le Lupinrangers. Kogure says that there's no need to retrieve Noel. So did Noel ask Kogure for such a request that his life isn't as important as gathering le Lupin Collection together? It looks like it! Bonjour readers! Well Lupinranger vs. Patranger may have finished its filming yet we can't deny this one -- the show isn't over yet and we do have four more episodes before le show ends. Things are getting tighter as le finale arc is about to begin! Sakuya is still at doubt to what Keiichiro has figured out. Is it me or does love or even mere infatuation make you blind? He still doesn't want to believe that Umika is indeed part of le Phantom Thieves. He decides to ask her out on his day-off -- trying to get an answer from her. 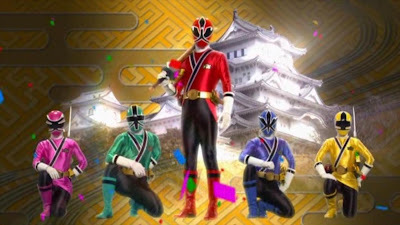 Currently, le Patrangers' side are still running their investigations on le possible identities of le Lupinrangers. They are now trying to conduct an investigation while still worrying about possible Gangler attacks. I remembered picking up GoGoFive and watching it then I thought about how Chikyu Sentai Fiveman nearly killed Super Sentai or how I prefer GoGoFive over Fiveman. Fiveman really just felt flat as Hirohisa Soda was already burning out. GoGoFive already had Junki Takegami working things out since Megaranger though one may argue Engine Sentai Go-Onger was a result of said writer burning out! The song "1-2-3-4-5 FIVEMAN!" was stuck in my head considering that the GoGoFive team were siblings which is why I don't really compare it much with Power Rangers Lightspeed Rescue too often -- except for the very trivial differences! Turboranger is pretty much what I've heard is a love it, like it, dislike it or for some even hate it but I'm a Turboranger fan. I could go ahead and rant all day that Turboranger as flawed as it is -- it's still better than Mighty Morphin' Power Rangers IMHO. Then I thought about celebrating its upcoming 30th anniversary would require something special after I had a friendly debate with Shogo B'Stard with what we both liked and disliked about the show. So here's my favorite episodes done in the same format as before -- Sentai Bandicoot style -- that is where certain arcs are compiled as "one episode". So let's get moving! Well Bonne Annee to all my readers or belated one since this episode aired not on New Year's Eve (boo) but on January 6, 2019 which is le first Sunday of 2019. So why wasn't this just made a Year End special than a year opening one? This is just a clip show which starts to refresh our minds of incidents before le series wraps up! Well is it me or is it tradition in Japan to make New Year's wishes? Le Lupinrangers go to make their wishes but as said -- be careful for what you wish for! Now it turns out we're having a crazy game show but IMHO -- it's really an intermission episode.